Originating from Queensland, Hedley Thompson was a tough and classy defender who went on to play 13 games for Tasmania and a record 300 for New Norfolk. He won two best and fairests and represented Tasmania and the TFL numerous times. 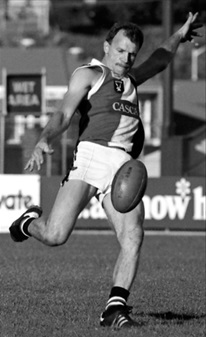 Thompson was a key player when New Norfolk won only its second premiership at senior level in 1982. He also coached the club and was honoured with selection in the Eagles’ ‘Best Team’ in 2001.